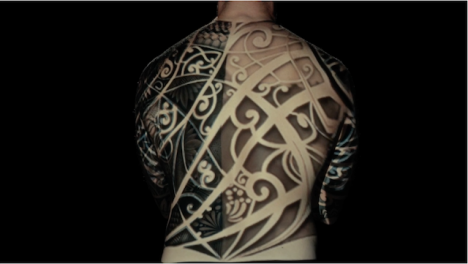 The world’s first live tattoo projection mapping event turned tattoos from static works into performance art, creating dazzling animations from inked body artworks. Filmed in Lisbon by Oskar & Gaspar, the above video highlights the infinite possibilities of this approach, from filling in details and colors to completing partial tattoos or even animating them in living color. Like the future tattoos from William Gibson’s book The Peripheral, the result can seem like organic behavior, with faces coming to life and snakes slithering across a body’s surface. Remarkably, the entire film was made without any post-production – what you see as the viewer of the short film above is exactly what the audience saw on the day of the event. We still may be a ways away from embedded nanobot tattoos, but when we get there, this will be an excellent source of inspiration for the tattoo artists of the future.